FIRST DOG HANDLERS COURSE at Crystal Palace. GLC's Chief Inspector Bernard Dawkins, Keepers Gordon Cook (+Prince I), Bob Kelleher (+Duke), Bill Hawes (+Cass), John Lebeau (+Prince II), Ken Attridge (+King), Inspector and Dog Trainer Bert Parrack. CAP BADGE worn by dog handlers. Keeper Vic George with his first dog Eddie. WARRANT BOOK - A certificate of Authority to enforce the Byelaws carried by all Keepers. 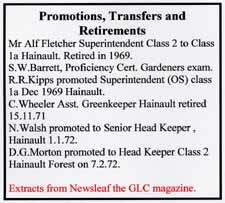 Extracts from Newsleaf the GLC Parks Dept. magazine. 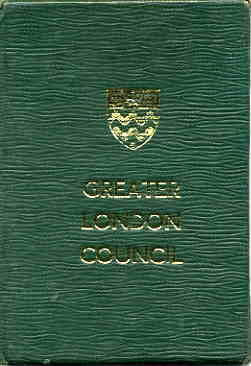 The Greater London Council came into being by Act of Parliament in 1963 and was an amalgamation of the former London County Council area with newly created outer London Boroughs. 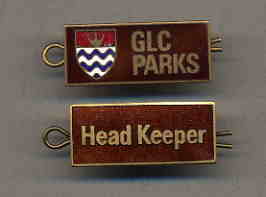 Many of the parks and woods in outer London were already administered by the LCC and the GLC inherited many of their traditions. In 1971 a Dog Handlers course was set up at Crystal Palace with the idea that Keepers would patrol the parks and deal with anti-social behaviour. 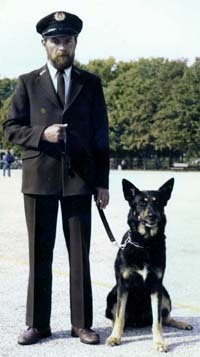 John Lebeau from Hainault Forest was one of the first group to qualify as a dog handler. A few years later Vic George qualified with his dog Eddie, which was superseded by Luther. All Keepers had brown uniforms with lapel badges. The dog section wore peaked caps with a special cap badge. Other keepers had a plain cap badge. This was the keepers public face when on patrol. More practical clothes were worn for maintenance work. Keepers were trained in the Byelaws which were prominently posted in all parks and open spaces. Each Keeper was issued with a book containing the byelaws and issued with a Warrant Book which gave them the authority to ensure that the byelaws were complied with. Superintendent Ron Kipps feeding the ponies in December 1969. Picture from Newsleaf 13 (December 1969. Animals from other Parks had their winter quarters at Hainault and it was not unusual to see Ponies and Llamas in the fields, and the early concept of a city farm had its beginnings here. 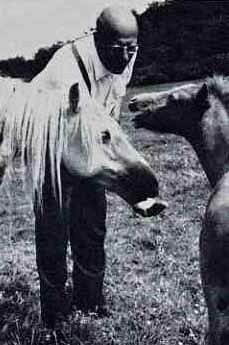 Keeper Horace (Wally) Drury is pictured with the Welsh ponies in 1964. He is wearing a homburg hat and sporting a uniform, collar and tie. Pictured casually dressed is Ronald Kipps, Superintendent (Class 1a) of Hainault Forest. Promoted in 1969 his previous post was Tooting Common. One of his first jobs was to set up Country Park status for Hainault Forest. The GLC were keen to set up Country Parks at Trent Park and Hainault following the Countryside Act of 1968. Government grants of up to 75% of the costs were available through the Countryside Commission. In an interview at the time he looked back on 35 years of service in the Parks Department and explained that the most important thing about the work was that he felt he was performing a useful service, which in the main, people appreciated. Job satisfaction and the fact that it was a healthy open air life had made him feel that all the hard work over the years had been worthwhile. He recalled that on one occasion one of the ponies gave birth to a foal at 5.30am and provided an instant biology lesson for the school camp inmates who had been roused to watch the event. 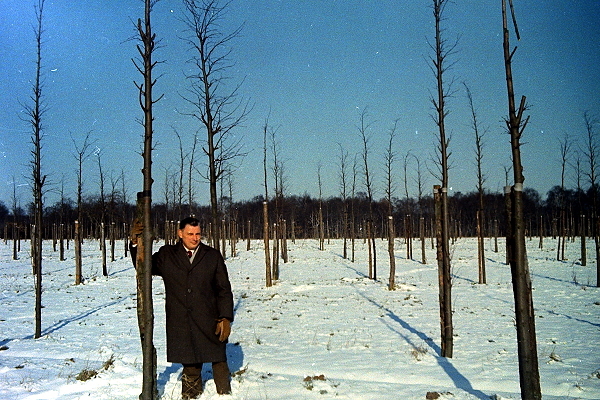 Peter Small from the Victorian Cottages in New North Road, standing in the tree nursery opposite in 1969. Comparing the two photographs it would appear that the trees have been pruned. Thanks to Raymond Small for the use of the photograph. 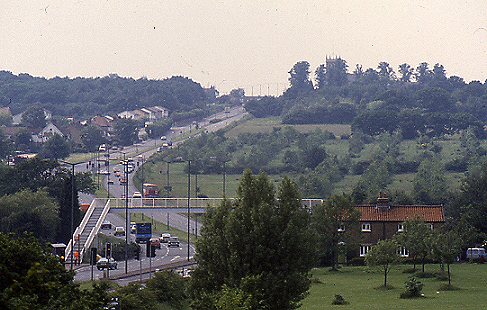 View from New North Road towards the footbridge and Hog Hill. The Forest Superintendent's house is arrowed and right of it behind the footbridge is 1 & 2 Hainault Cottages. All were demolished in March 2011 following much vandalism. 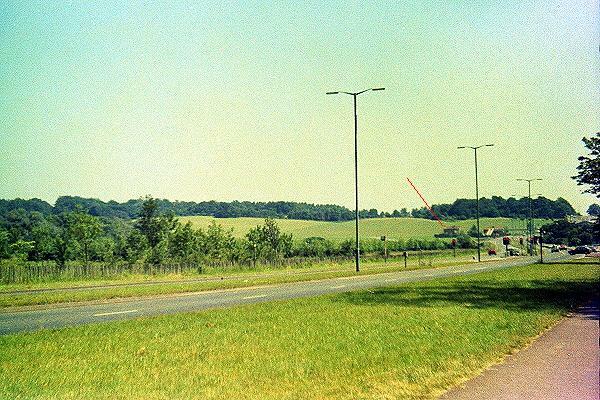 View of 1 & 2 Hainault Cottages (demolished in 2011) with the Romford Road towards Chigwell Row and Church. The plantation, seen as lines, is growing well in the middle of the picture. View of Farm Barns and outbuildings including the Camp Huts on right of picture. The farm with livestock was developed on land in the foreground on the picture. 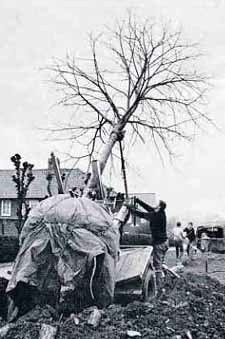 One of the first jobs that the GLC carried out at Hainault was the establishment of a tree nursery to provide trees for the London and local roadsides. 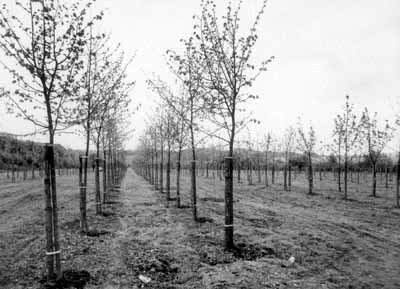 Many different species were planted in rows and grown on to be replanted later in suburbia as mature trees using Newman's Transplanting machine. With the demise of the GLC the area became overgrown but today many interesting mature non-woodland trees can be found there. Eleven football pitches and six cricket tables were provided. The 2 hockey pitches available on the grassland area were by 1969 underused and soon abandoned. The old farmhouse was demolished and changing rooms were built on the site and opened in 1969. Regular cross country runs were held. 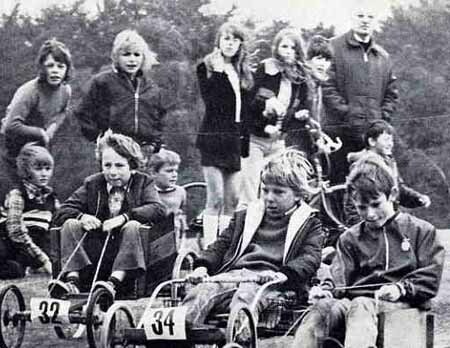 Many fun events were organised including a Soap Box Derby in 1972 sponsored by the Ilford Recorder. The GLC were also responsible for the Golf Course. Rivalry between the Parks staff was often settled by a game of golf at Hainault. In 1965 Hainault Forest keepers beat Beckenham Place Park 10½ wins to 8½ wins. 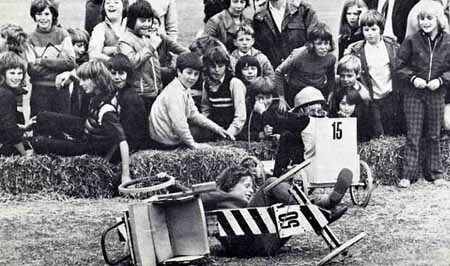 ILFORD RECORDER'S SOAP BOX DERBY Sat 18th Sept 1972. Were you there? 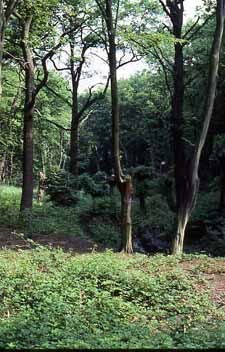 In an attempt to maintain the ancient hornbeam pollards that Hainault Forest is famous for, pollarding was carried out on selected trees in an area around Lambourne Well in the winter of 1983/4. 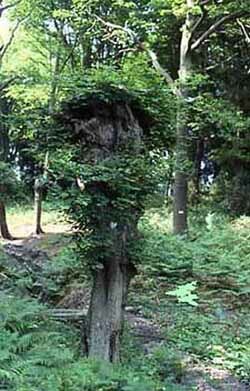 Some were totally lopped at the crown and others had one branch left on. At the time this was the correct procedure, and the following spring of 1984 luxuriant growth was produced. But such is the shock to the system that in most cases this treatment introduced disease and hastened the death of the trees. The hurricane of 1987 laid many low. It is now known that only a very small percentage survive repollarding. 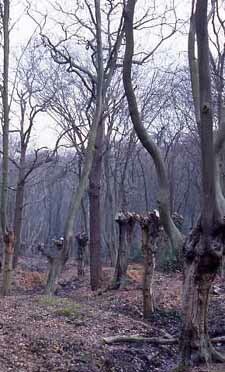 Today the Woodland Trust are starting the process again by pollarding young trees. 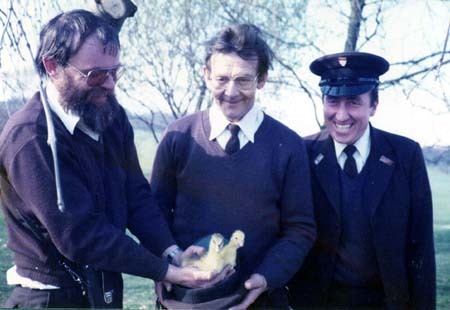 Keepers Vic George, Freddie Doe and Ted Peak with ducklings.